Douglas, the only ant in his colony with a name, is a bit different. 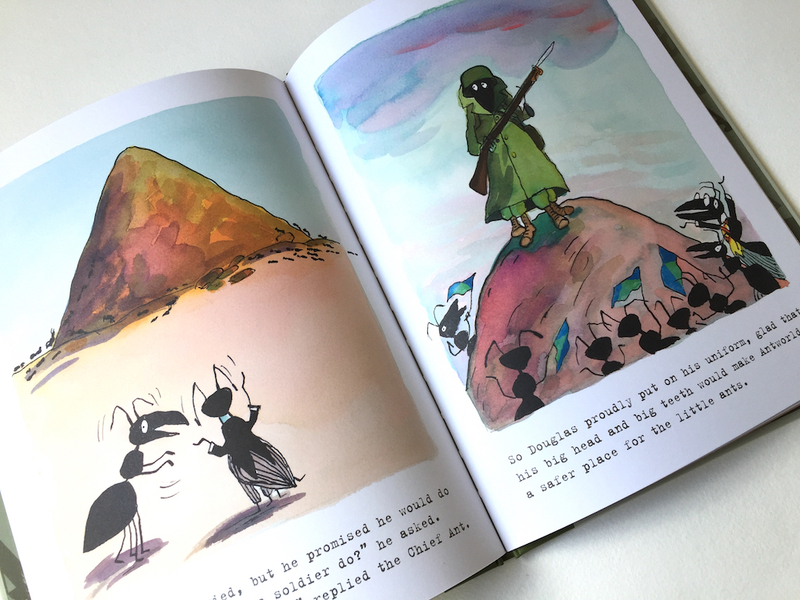 He just wants to fit in and carry food in a beautiful line, but in ant society you are what you are pre-destined to be, and the colony want him to be a soldier. 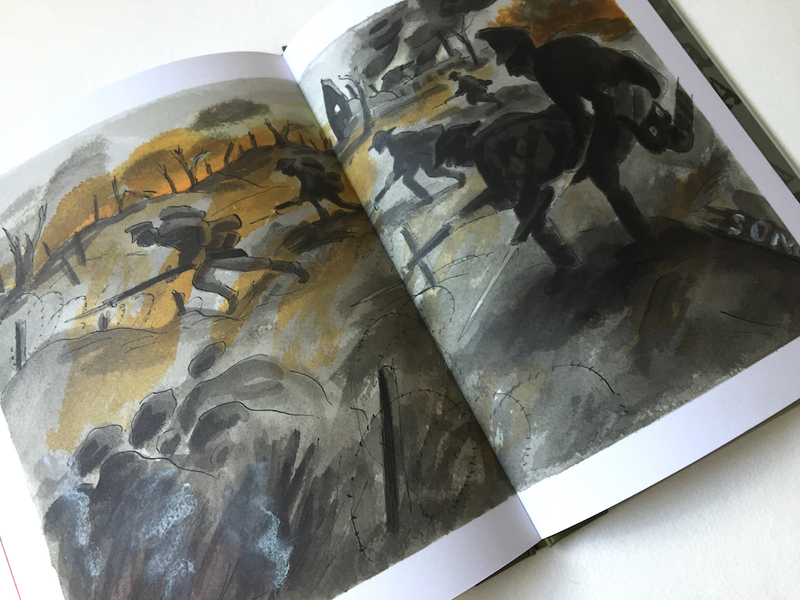 We follow Douglas in a sped up version of his life in this latest illustrated story from AOI Patron, Tony Ross. It’s sure to spark lots of questions and debate, and that is its power. 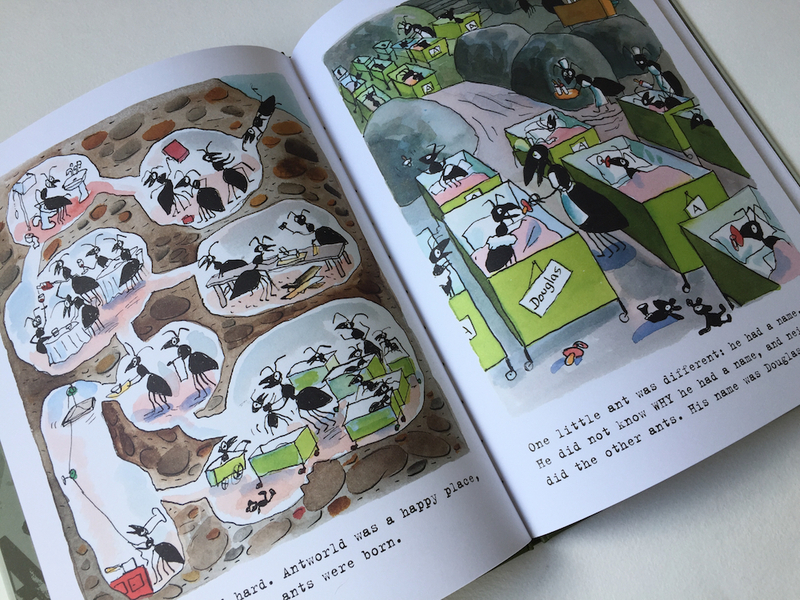 The illustrations have an immediacy and movement to them that you would instantly recognise as Tony Ross’s work. Their charm makes you fall in love with Douglas straight away, making the sudden, dramatic plot twist even more impactful. 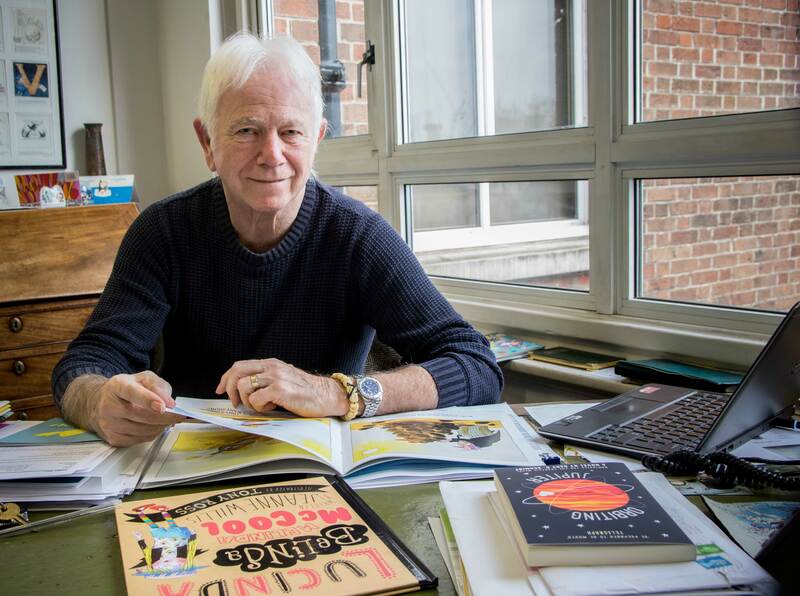 I caught up with Tony Ross to ask him a few questions about Douglas and An Anty-War Story. RM: An Anty-War Story manages to be both playful and sobering at the same time. What inspired you to write the book? TR: Many years ago, I was walking on the field of Waterloo, and a rabbit ran by. It seemed obvious at the time, that there were rabbits there in 1815, during the battle. Also, all the others, cats, dogs, mice, butterflies, and insects. Many of these must have been killed in a battle that had nothing to do with them. Whereas there are monuments to the dead of the armies, there are non to these non combatants. So, here’s to their memory. Without giving away the twist, the tone changes abruptly in this book. Did the book grow around that part of the story, or did that idea come later in the process? The change of mood was the initial idea – I am usually quite uncontroversial, but war is important. The age old method of solving issues of greed, expansion, and aggression. Although war is important, it is only by understanding it, we can find better solutions. The more we understand something, the more we can be in control, and limit it. Children are a very honest audience; has there been any feedback from them about the book that you’d rather not have had? No feedback at all, that I am aware of. I hope it starts discussions about the finality, pain, and pointlessness of war for children in their classrooms and at home. When you’re drawing a character like Douglas, do you just start drawing and ‘whoosh’ there he is, or do you go through many different possible versions in sketch form? He came out of my pen straight away! By making Douglas such a likeable character, you might have saved a few real ants from a purposeful stamping or frying under a magnifying glass. Was there an ecological slant, as well as an anti-war background to this story? No ecological slant at all, although I like the point you make that the book may be party to stopping some small creatures being fried or stamped on. 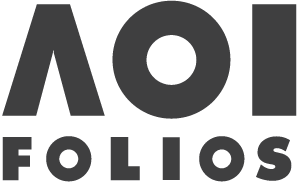 What’s are the best and worst things about writing and illustrating your own story, as opposed to working alongside an Author as an Illustrator? The best thing about working on my own stories, is that I don’t have to write about things I can’t draw. Also, I don’t have to ask an author about textual things that are not clear. The one drawback is, I miss chatting about things with a nice author. What’s the next thing you’re working on? Right now, I am working on a book with Michael Rosen, Always a pleasure. 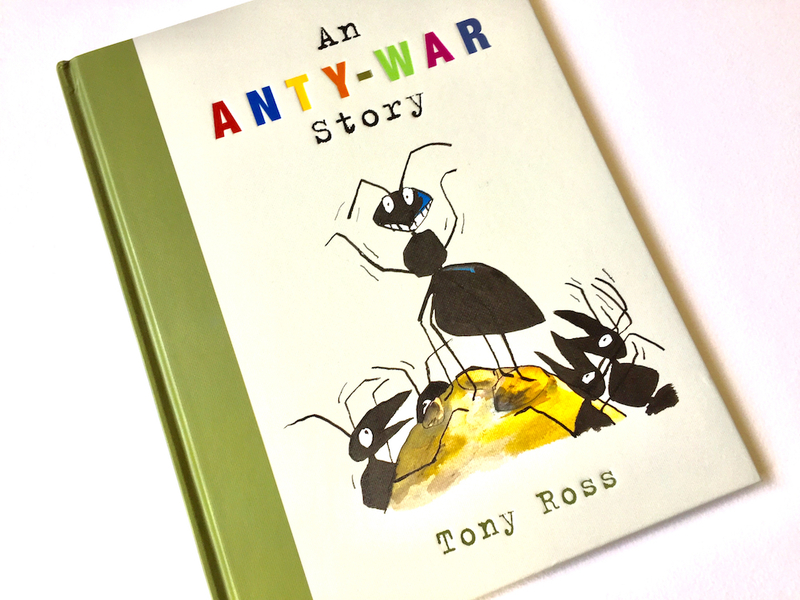 While we wait to hear more of the latest Ross and Rosen collaboration, I’d recommend An Anty War Story as the perfect way to address the idea of war with children. 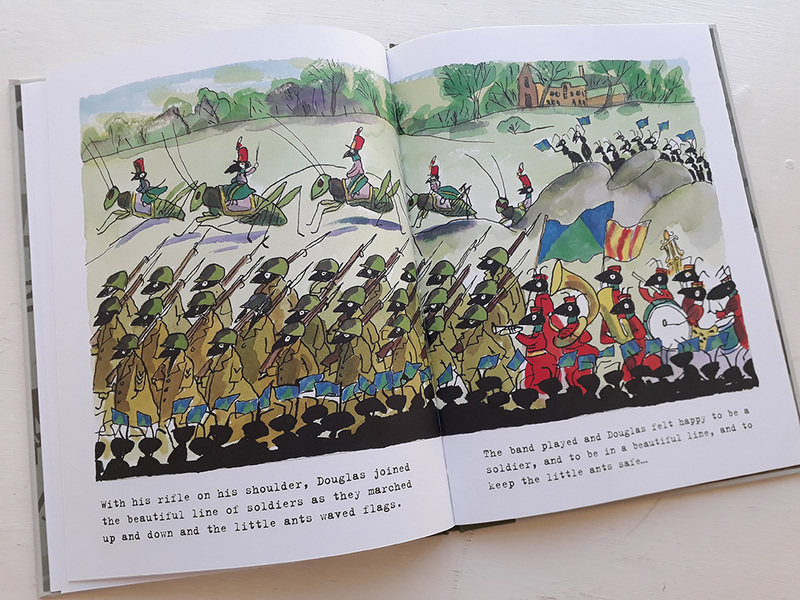 The consequences of war are constantly in the news, and the brilliant way children naturally make sense of things they see or hear about is perfectly complimented by this book.